Recently, the Nixes came to dinner with their kiddos who are, respectively, 4 days, and 9 weeks, older than our kiddos. They are all very good friends, and we were able to shuffle them off to play after dinner while the adults sat and chatted. Whoohoo! I can't remember the occasion - though I know I actually cooked dinner - but it was the perfect opportunity to make these special cookies. And... surprise! Marshmallows in the middle! I have to admit, I was really excited about these cookies and I did not really love them, which is disappointing because the author of the blog where I found them, did. Both the cookies and the glaze tasted of cocoa rather than chocolate. I didn't use the super-special Valrhona cocoa, primarily because I'm finding it prohibitively expensive. I've made several recipes flavored with cocoa lately, and they have all had that strong cocoa-not-chocolate taste. So either I've become more sensitive to cocoa, the recipes aren't great, or I need to bite the bullet and invest again in Valrhona. Back to the cookies. They actually tasted like a store-bought snack cake. The consistency was just right: the cookie was cakey, which isn't usually my favorite, but it complemented the marshmallow and glaze perfectly. The marshmallow gave it added sweetness and chewiness. And though I didn't like the glaze alone, its flavor worked well with the other two components. I was disappointed that the marshmallows held their shape as much as they did; had the edges been more softly rounded, the chocolate glaze would have more thoroughly disguised the surprise inside. Verdict: though there was nothing exactly wrong with them, they were certainly not worth all the work, so I won't make them again. But I'll let you decide for yourselves! Preheat oven to 375F. Whisk together flour, cocoa, baking soda, and salt; set aside. Cream butter and sugar until light and fluffy, about 2 minutes. Add egg, milk, and vanilla, and beat until well combined. Add reserved flour mixture and beat on low until combined. Use a 1 3/4" cookie scoop to scoop dough; place cookies about 2" apart on a cookie sheet lined with a silpat or parchment. Bake until cookies begin to spread and become firm, 10-12 minutes. 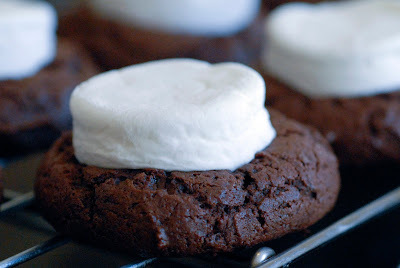 Remove cookies from the oven and place a marshmallow, cut side down, in the center of each cookie, pressing down slightly. Return pan to the oven and bake for another 2 or so minutes, until the marshmallows begin to melt. Transfer cookies to a wire rack to cool completely. Whisk together the glaze ingredients. 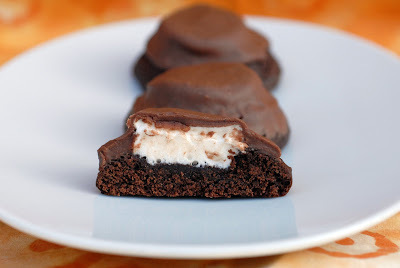 Spread about a tablespoon of glaze on each cookie so the marshmallow is completely covered. I tried doing this two ways: I dunked the cookies in the glaze, then shook them gently to remove the excess, and I also used a small offset spatula to spread the glaze. Dunking covered them adequately but really got too much glaze on each one; the offset spatula worked better. Don't they look like they should be good? Oh well! TSK. Disappointed - ONLY buy Valrhona, Jami. They DO look like they would be soooo good! :( Oh well! 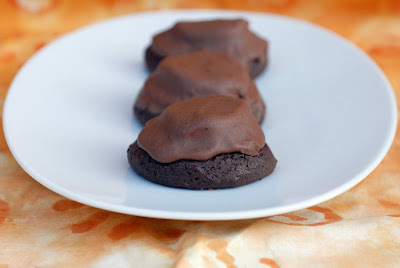 Next time use less cocoa in the cookie and use REAL melted chocolate for the coating. Do you think chocolate gnosh would work, if you dipped the cooled cookies on the wet gnosh? A thin ganache - glaze consistency - might work, Lorraine. Thanks for the suggestion. It would certainly taste better! !